Perhaps one of the most convenient features that we have today is the ability to get navigation and traffic information on our mobile devices. Google Maps is a huge player in navigation. Google constantly partners up with companies and updates their Google Maps application so that its users can continue to get the most up-to-date information while traveling and navigating. 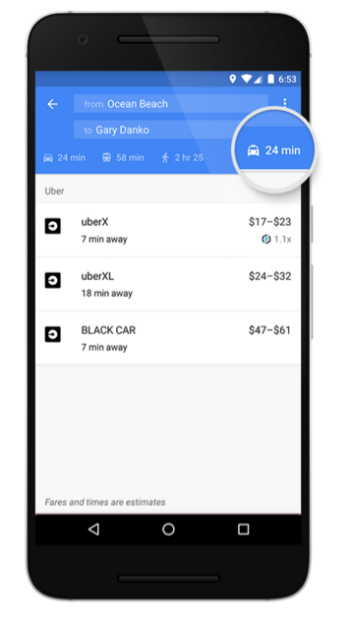 Google recently announced that it’s going to get easier for users to determine the best ride services option within the Google Maps app. 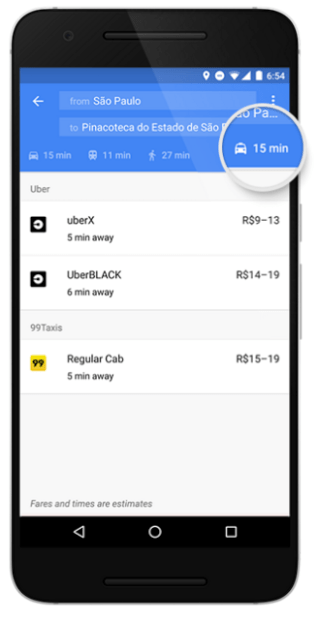 This feature will mostly be beneficial to those who are taking a taxi, Uber, or other type of ride service. With the new update users will be able to see pricing options between different companies that are partnering with Google. If you have the company’s application downloaded on your phone you’ll see the information on pricing right on your Google Maps screen. Now you don’t have to worry about opening different apps just to get the information you wanted. Google is currently teamed up with Uber, 99Taxis (Brazil), Gett (UK), mytaxi (Germany, Spain), Hailo (UK, Spain) and Ola Cabs (India). If you use these companies for their ride services you should soon start to see pricing options within Google Maps. Google currently shows Uber’s pricing differences between different types of cars, like the uberXL and the uberX. Google will be rolling out the update for the Google Maps app on Android in the next few days and we should also see an update to the iOS version soon, as well. Be sure to keep an eye out for the updates on your operating system of choice. For more information about this new addition to Google Maps take a look at Google’s official announcement here. Christina is a tech lover who currently lives in California. She has been writing about technology for about three years and has loved every minute of it. Christina has had the opportunity to go to CES and explore upcoming tech. She currently uses an iPhone 6s Plus as her daily driver. When she’s not writing or working she’s playing video games like Call of Duty, Fallout or Pokemon. She’s always down to converse with fellow geeks and nerds.